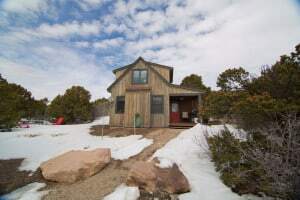 Winter may be the slow season for Moab, but Whispering Oaks’ cabins provide amazing views, and perfect access to some of the most popular snowshoeing, cross-country skiing, and snow mobile trails in the area. And after a fun day of playing outside, you can come back and warm up with all the great amenities our Moab cabins have to offer! The La Sal Loop Road is maintained and plowed through the winter. In addition to having this main route plowed, we maintain all of our roads and driveways, ensuring easy access to each of our seven cabins. Even with the roads plowed, we always recommend 4-wheel drive in the winter, and a safety kit in your vehicle. Please see our Map & Directions for more information about our location and driving directions. In the winter we recommend using the Quickest Route from Moab to Whispering Oaks Ranch. Our special rates for the winter season begin in mid-November and run through February. Visiting us in the off-season allows you to enjoy our beautiful cabins at 30-40% off the regular pricing. If you are the type that likes avoiding the crowds, then winter is an excellent time to visit Arches and Canyonlands. 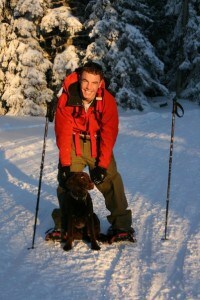 Many of the popular hiking trails are accessible year-round. If you’re looking for some great snow activities with awesome views, check out the Geyser Pass area (only 7 miles from the cabins) for popular sledding, snowshoeing, cross-country skiing, and snow mobile trails. Visit Discover Moab for more information and a map of this area. No matter where you go…the mountains or the National parks, there’s always so much to explore!